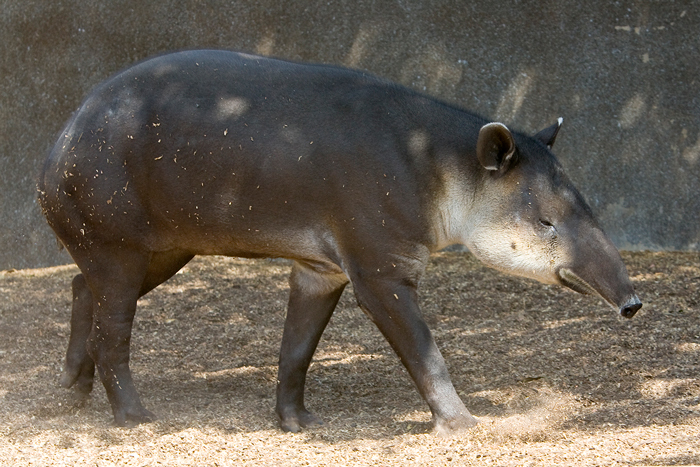 *Taxonomists are still debating the organization of tapir species. The above taxonomy is followed by IUCN, but also see alternate species taxonomy in Taxonomy. Less than 10 cm for all species. Short hair; some species with manes. Coloration varies by species. Populations declining for all species. Walk in zig-zag fashion, with snout close to ground for better smelling. Good swimmers. Feed before dawn and at dusk. Rest during the day; sleep between midnight and dawn. © 2009-2019, San Diego Zoo Global. Taxonomy, body measurements, and population estimates updated in 2017. Taxonomy updated Feb 2019. 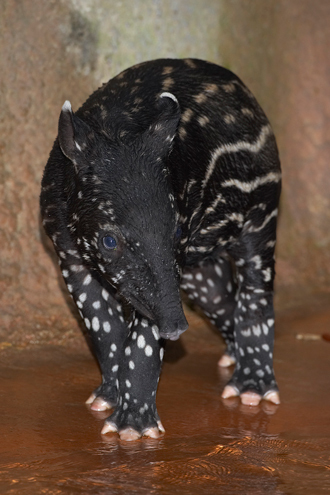 Having speckled coloration helps this young Malayan tapir camoflague with its forest habitat. These spots resemble how sunlight looks on the rainforest floor (after passing through the canopy).